Part II - Should I consider planting trees around my farm? In the previous Science Page, we stated that sites located higher on a slope have lower incidence of PRRS compared to sites at the bottom. As previously mentioned, we used data from over 700 swine sites participating in the Swine Health Monitoring Project that shared weekly PRRS incidence data. 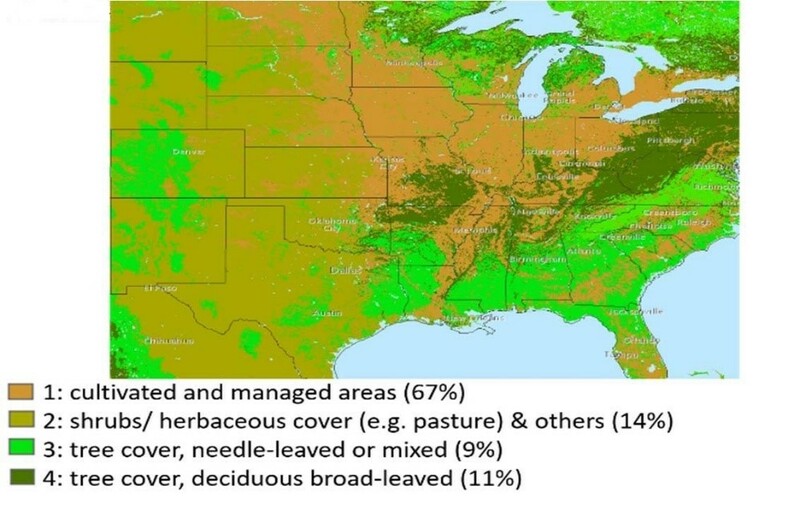 A raster created by the European Commission (Global Land Cover Project, 2000) was used for this project, and considering the swine sites enrolled in the project, four different categories represented the land coverage (Figure 1). A model was constructed to test whether swine sites located in areas with shrubs, herbaceous cover, needle‐leaved and broad‐leaved trees had different incidence of PRRS outbreaks compared to sites located in cultivated managed areas (crops). Figure 1. Land coverage raster. Bracketed numbers in legend represent % of participating farms for each category. The results from our final model showed that being located in areas with shrubs/ herbaceous cover reduced the incidence of PRRS by 0.7. Being located in areas with needle‐leaved and broad‐leaved trees reduced the incidence of PRRS by 0.6 and 0.4, respectively. Said differently, our results suggest that being located in areas with shrubs or trees decreases the incidence rate by at least 30% compared to sites being located in cultivated areas. These “protective” effects from “green” coverage are not new in the poultry industry, even though this has never been described for PRRS. Planting trees around poultry farms has been described as beneficial not only because trees can provide shade and for their visual appeal, but also for filtering airborne pathogens and for reducing odor emissions (Patterson et al., 2008). Even though this study showed interesting results, we need to take into account the fact that the raster obtained for land coverage is dated from the early 2000’s, and these features might have changed for the current period. The University of Minnesota group plans for a follow‐up study that will validate these preliminary findings. Stay tuned!